Unhappily, the large majority of Cy’s commercially recorded music remains largely inaccessible in out-of-print vinyl record format. While certain lucky collectors have these records, most persons seeking them are relegated to searching old record shops’ dustbins (itself a pleasurable task to some of us smitten with the collectors’ bug), or perhaps bidding for them on the rare occasions when they arise on Ebay. Others of Cy’s recordings fall into yet a still rarer category, that of radio transcription discs or of unique recordings which have never been commercially released. The Walter family has, for many years now, been in the process of transferring and remastering Cy’s recorded music to digital media, working with award-winning audio engineer Seth Winner (of Seth B. Winner Sound Studios, Inc., 2055 Whalen Avenue, Merrick, New York 11566-5320; 516-771-0028; SethBWinner@optonline.net) and expert San Francisco-based audio engineer Rob Geller (rob_geller50@yahoo.com). We are happy to report that the rare transcription discs, the most fragile acetate and lacquer discs, and all of the 78- and 33-rpm records are now retained in digital format. Some of the transfers have already been filed with the Library of Congress and may be enjoyed there; the balance of them will be similarly filed shortly as part of the recent happy completion of a related project, The Cy Walter Annotated Discography And Musical Anthology. In undertaking the music’s remastering, it became clear that Cy’s diverse recording career, spanning as it did from the 1930s through the mid-1960s, warranted a careful cataloguing if ever it was to be properly preserved and truly enjoyed by listeners and researchers alike. Accordingly, Mark Walter, Cy’s son, began the process of creating this comprehensive Discography, corresponding to a digital Anthology (ultimately comprising twenty-five CDs and some seven hundred-plus songs) of Cy’s recorded music. In so doing, Mark found many a biographical and autobigraphical tale relevant to the music worth telling, and so the Discography became an annotated one as well. The Discography’s completion, appropriately enough, has occurred in the centennial year of Cy’s birth, 2015. It should also be noted that three commercial CDs of Cy’s musical creations have been released. 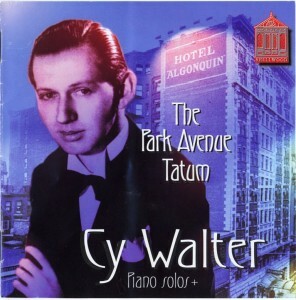 In this regard, and due to the concerted efforts of Alex Hassan, Michael Lorenzini, Peter Mintun, and others, a terrific disc entitled The Park Avenue Tatum: Cy Walter Piano Solos+ was released in 2006 by the British label, Shellwood Productions. Sadly, this fine company has ceased operations and so this CD is now a collectors’ item. A second CD release, comprised of Cy’s excellent 1956 Atlantic LP entitled Rodgers Revisited, was issued in 2008 on the Sony Collectables label. And, most recently, in 2015 and as a Centennial Tribute album, Harbinger Records has released a two-CD set of Cy’s rarest pre-1950 recordings, entitled Cy Walter, Pianist; Cy Walter, Composer: Sublimities. Produced by Mark Walter and Ken Bloom and Bill Rudman of Harbinger Records, this terrific CD release topically comprises recordings of Cy as solo pianist; as multiple pianist; as accompanist; and as a composer (of originally-crafted and beautiful songs). It is available through www.harbingerrecords.com .